This is an old-fashioned Italian appetizer, served throughout Italy. This is a classic Italian dish, with usually some time of tomato spread. It was Italy’s first sandwich. There are so many types of Bruschetta. In Italian Bruschetta means toast, to be more accurate roast over coals. This was one of Italy’s first BBQ dishes, it was also a great way to use up oil. The tomato mixture on top is one of the most common toppings of bruschetta, this is a very easy and versatile recipe to switch out. 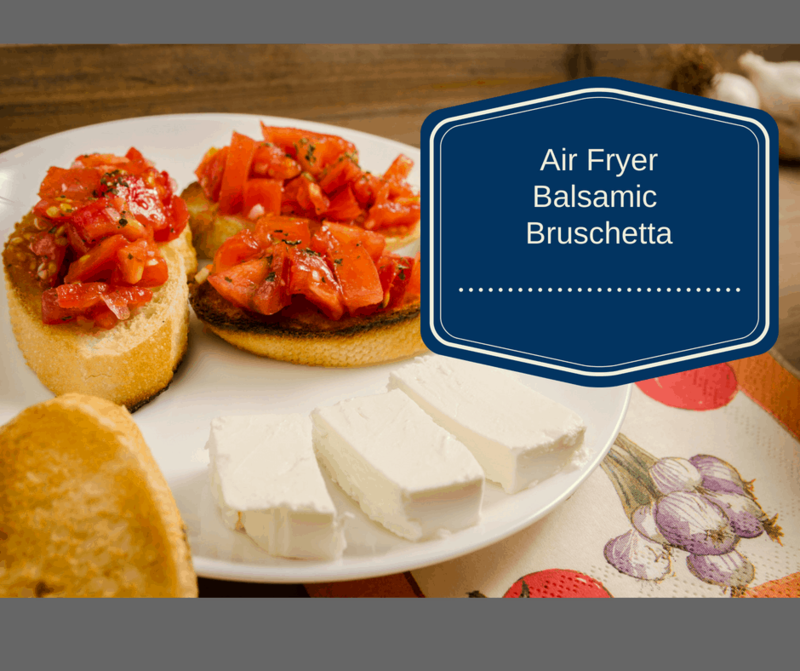 The use of the air fryer, allows you to make a ton of appetizers quickly. This is a great use of the air fryer, and it makes a great summer snack. Kids love them, because they use their fingers to eat them, and all food is better when it’s eaten with your fingers. I added Balsamic vinegar, which adds a quick punch to the appetizer, but at the same time, adds a great balance between the olive oil and vinegar. The best thing to do is to make the tomato mixture the night before, and then let the flavors set in the refrigerator, stir right before you want to add it to the top of the toasts. If you would like to melt the cheese, which my kids love to do, just put it back in the air fryer for about 1 minute at 220 degrees F. The only bad thing about doing this is that the tomato mixture gets hot, I prefer to keep the entire tomato mixture cold. but since it’s your appetizer, it’s really up to you. Remember to add the salt and pepper and mix well, adjust the amounts you want, based on your own preferences. I hope you and your family enjoy this recipe. Start by adding the diced tomatoes, diced basil, shredded Parmesan cheese, garlic, vinegar, olive oil, salt and pepper to a mixing bowl. Meanwhile, cut your french bread into slices, as you slice them, place them into the air fryer, and when the basket is full, but not crowded. Set the time for 3 minutes at 220 degrees F.
Remove the bread, which should be slightly toasted. If not, add another minute. Then remove the bread, and place on a plate, top with the tomato mixture.